A. Attached or Single? Attached for the last 15 years to Tim. 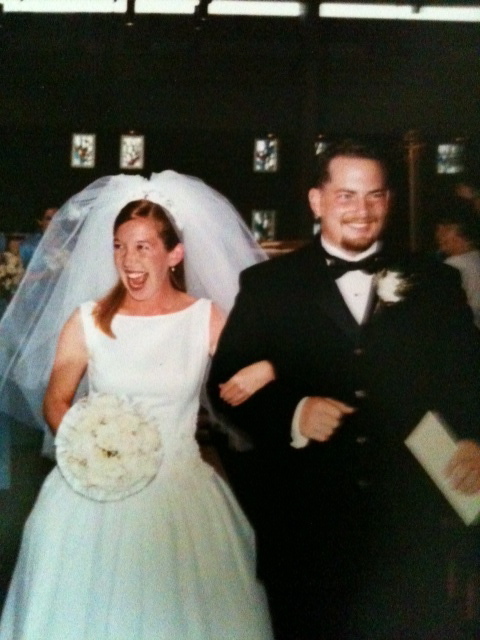 We've been married for 13 years (we got married in 2000 which is an easy way to always remember how long we've been married). B. Best Friend? My pal Steph, although sadly our lives are crazy busy and we don't hang out so much as we want these days. We always make time for a Madonna concert. C. Cake or pie? Chocolate cake and pecan pie. After I had my first baby, I could eat an entire pecan pie (from Kroger's bakery) in one sitting. I'm not bragging, but I do think that's kind of impressive. D. Day of choice? I like Thursdays. Over the hump of mid week, but still in a good routine groove, but not completely bone tired like I am by Friday nights. E. Essential Item? My iPhone. I am nothing without it. F. Favorite color? I am into sea foam blue right now. G. Gummy bears or worms? Neither. With my fourth pregnancy I became obsessed with fruit snacks, but it was a weird phase/craving for me. H. Hometown? Grew up in a suburb of Kalamazoo, MI, yes there really is a Kalamazoo and yes, it sort of has suburbs. Portage, Michigan is my hometown. But I also feel like Pittsburgh, PA raised me a little too (I lived there in my early 20s). I. Favorite Indulgence? Other than pecan pie? Red wine. J. January or July? July, 100 percent. I love hot weather and not needing a coat. K. Kids? I am a member of the Mom of Four Club. My Mother's Day morning full of love ( and chaos). L. Life isn't complete without? TV, I love television and always have. And of course my family, but that goes without saying right? N. Number of brothers/sisters? One older sister, two younger brothers. I am a classic middle child. O. Oranges or Apples? Gala apples are my fav. P. Phobias? Frogs. I have a severe, unexplained phobia of frogs and toads. I scream, hyperventilate and run away when I see a frog. I can't even look at a picture of a frog. Even typing this right now is making me tense. I live in fear of one of my kids bringing a frog home one day from the backyard. This was from an old ditto from a literature class in college. Yeah, I said ditto. R. Reasons to smile? My kids' love of life, their imaginations, their wonder and their playfulness. My Lucy feels joy with her whole entire being and I love watching it. Oh it may be just a pile of laundry to most people, but to Wade it is an adventure. S. Season of choice? Summer!!!!!! Flip flops, swimming pools and long days. I live for summertime. U. Unknown fact about me? I bet a lot of people didn't know the frog phobia. Another unknown thing...one time, a million years ago, I danced on a local TV show (a children's show) to Michael Jackson's Beat It (and I still remember most of the routine). V. Vegetable? I love peas. W. Worst habit? Overthinking and worrying. I could win awards for being the biggest worrier, but nobody gives awards for that. Waaaa. X. Xray or Ultrasound? If I had to choose, I guess ultrasound. Y. Your favorite food? I am very into avocados right now. I'm also always into pizza. I am married to a Tim too and we got married at the end of 1999. Still pretty easy to remember. ;) And because you love pecan pie AND red wine, I think we would get along really well. Thanks so much for joing Old School Blogging, hope you will again next month! SO Great to find your blog! I definitely think we would get along. I love your blog. And I love the Old School Blogging, I look forward to linking up again next month.